A graduate of Indian Institute of Technology, Delhi, Anjan Ray received his Doctorate in Chemistry from the University of Pennsylvania under the guidance of Nobel Laureate Prof. Alan MacDiarmid. He then moved to the Chemical Industry and worked for over twenty five year across functions ranging from Quality Control, Technical Service, R&D and Marketing to General Management, Mergers and Acquisitions and Corporate Strategy. His professional interests have spanned fields as diverse as surfactants, oleochemicals, paints, adhesives, textiles, cosmetics, pharmaceuticals, water treatment, energy efficiency, biofuels and renewable energy policy. 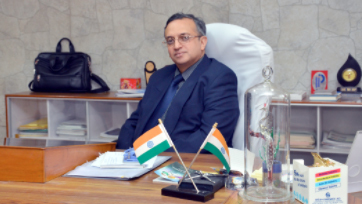 Born April 27, 1963, Dr Anjan Ray is the eighth Director of CSIR-Indian Institute of Petroleum who also held the additional charge of Head, Research, Project Planning and Business Development Directorate at Headquarters of Council of Scientific and Industrial Research, New Delhi till August 2018. Apart from his professional career in chemical technology, Dr Ray has had an active interest in media, education, heritage and environmental conservation for over three decades.